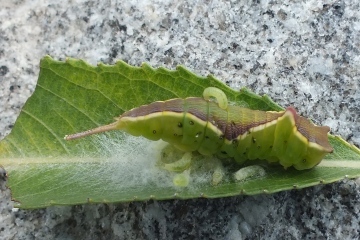 At first sight the leaf it was on appeared to be covered with a "spiders web", but close examination revealed that the caterpillar was on a bed of chrysalis'. Imagine our shock when as we watched the grub on it's back suddenly emerged. Looking at the photograph the emergence burrows, of the other grubs, can be seen randomly dotted along the caterpillars side.